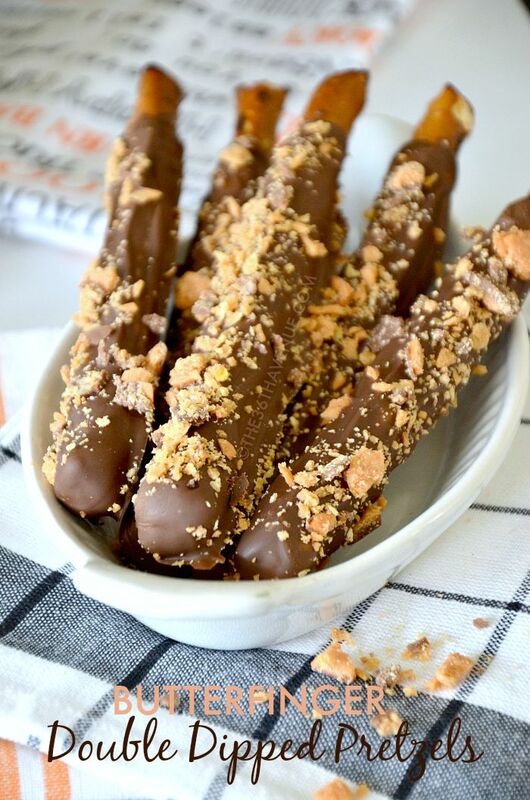 These Butterfinger Doubled Dipped Pretzels are amazing! This is one of our family favorite snacks! This recipe is so good, easy to make, and fun to eat! The butterfingers give the pretzels a delicious crunch while the caramel and the chocolate make them taste like Twix. So yummy! One of my favorite things about these pretzels are the delicious layers! First they are coated in caramel, then a layer of creamy chocolate, and I finished it with crunchy butterfinger pieces. I need to hide these from my kids every time I make them if I want to have any hope to eat some! Give this recipe a try… You are going to love them! Dip pretzels in caramel; spoon additional caramel over pretzels if necessary to evenly coat them. Let excess caramel drip off and place on prepared wax paper or cooling rack. Place the chocolate chips and shortening in a microwave safe dish and set the power to medium. Microwave the chocolate chips for 30 seconds at a time stirring in between. When your chocolate is mostly melted, use smaller intervals of 5 to 10 seconds and stir in between until it is melted. Dip the caramel pretzels in the chocolate, again spoon additional chocolate over the pretzels if it is needed and let the excess chocolate drip off. Place them back on wax paper or cooling rack. Crush the Butterfingers and while the chocolate is soft sprinkle the butterfingers on top of the pretzels. Refrigerate 1 hour. Remove from refrigerator 10 to 15 minutes before serving. *Color Candy Melts - You can find these at Wal-Mart or crafts stores in the baking aisle. Oh my gosh I have absolutely got to make some of these, my husband LOVES chocolate dipped pretzels and I bet he would totally flip if I made some of these! These look fantastic! My husband love pretzels and butterfinger. This is his match made in heaven! I can’t wait to make these for him!